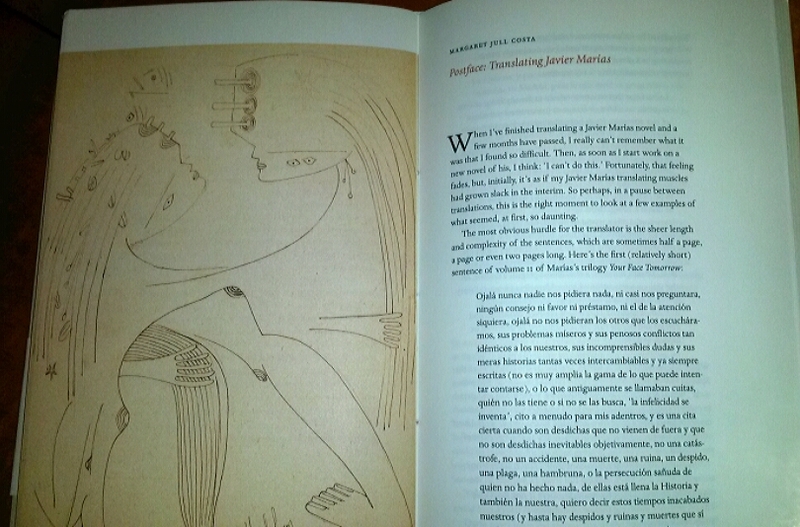 In the opening paragraph of her “Postface” to Javier Marías’ recently released contribution to the Cahier Series, To Begin at the Beginning, famed translator Margaret Jull Costa confesses that every time she starts to work on a new Marías novel, she thinks: “I can’t do this.” His work, with its long, convoluted sentences, and its precise, but shifting, language lies ahead of her at the outset of each project, and until she gets back into the flow she feels a sense of anxiety. I must admit that similar sort of uncertainty faces me as a reader. I wonder, am I ready to commit to Marías again right now? Unfortunately, with a few efforts since I was first swept away by A Heart So White many years ago, the answer has been no, not now. So imagine my delight with this short, reflective essay about the art of taking the stuff of life—the truths and myths that arise from one’s own family history—and using, even re-using them, to tell stories, create literature. I found this Marías, talking about his family, and his approach to the art of writing, so wonderful to read that I’ve mentally added his trilogy to my list of books to read. And that is one of the absolute joys of the Cahier Series: the opportunity to meet, or meet again, a writer or translator, and spend a little time with them as they explore writing or translating, or the intersection of both, in unique and original ways. Marías, the highly-respected Spanish novelist and translator, sets out in this piece to explain his desire to devote his energies to writing “inventions,” and why, even when he borrows elements from real life, so to speak, he is inclined to break them up, and blend them into his fictional characters and creations rather than putting them in, unaltered. Of course, in the essay that follows, he goes on to share aspects of his own family history, reaching back to his Cuban great-grandfather, pulling out some of the stories that have made their way into one or more of his novels. This abbreviated family history is fascinating in its own right (inadvertently causing one to think that any story “true” or otherwise can be magic in the hands of the right storyteller), but his discussion of his process of re-imagining and working people and incidents from the past into his fictions—and the decisions he has faced when handling elements of the real within the world of invention—is equally compelling. Marías reports that, when he writes, he applies the same principle of knowledge that is at play in life. He does not know if what he writes at page five of a novel will prove to be a good idea at page 200 any more than we can know if what we do at age twenty will seem to have been wise from the vantage point of forty, and so on. In writing, one has the advantage of editing, adjusting events back and forth between earlier and later portions of the work, giving meaning to the capricious and superfluous, as required, so that “what had no meaning at the beginning does have meaning at the end.” Subject as it is to the unforeseeable variables that mould reality, he contends, life makes a very poor novelist. Imagination is a critical mediator—and one of the essential keys to literature— filtering the invented and the actual, rendering everything equal. 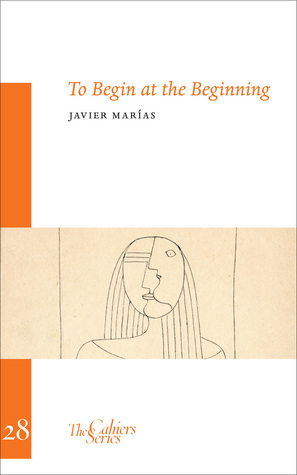 To Begin at the Beginning, the twenty-eighth addition to the Cahier Series, offers an opportunity to spend a little time in the company of a renowned novelist and his chief translator. 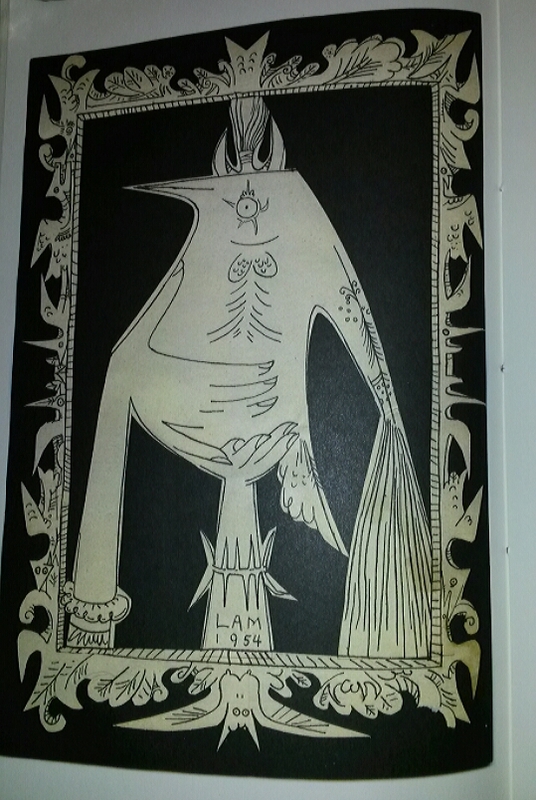 Illustrated by the works of Cuban artist Wilfredo Lam, it will likely be appreciated by Marías’ committed readers. For those who have little or no experience with his novels, it serves as an ideal introduction, or, as in my case, an inspiration to read more. The Cahier Series is a joint publication from the Center for Writers and Translators of the American University of Paris and Sylph Editions. I’ve never thought Marias a writer that would appeal to me, but this looks like a good place to dip my toes. There is something that pulls me in when I read (or hear) a writer talk about their process. Marías has his devotees, but I sense he can also be inconsistent. After this book, his trilogy has my attention. I don’t think he implies that he never plans his drafts, just that in the writing, certain things may become more (or less) important to overall story. This is true in our own life stories but we cannot go back and “edit” the past. In one of the circumstances he writes about, the relevance of a real life incident (or at least a family mythology) is not apparent until the death of the person involved. I’m sure you will find this essay especially interesting given your familiarity with his works. I really liked this side of him. His fiction can exhaust me. What a fascinating post. I’ve been trying to work my way through Marias’ oeuvre over the past few years, with the rough aim of reading one of his novels every twelve months or so. Like you, I was captivated by A Heart So White — it remains my favourite of the four I’ve read so far — but I also loved The Infatuations, a novel several other readers seem to view as a lesser Marias. This essay wasn’t even on my radar, so thanks for the tip – I’ll definitely be adding it to the list. Love the Cahiers and will order this one. Thanks for such a compelling introduction! They are wonderful. They always seem to be much larger than their short length might suggest. I’ve never read one that does not linger in my mind. Javier Marias is a writer I’ve heard so much good press for that it’s probably criminal that I still haven’t read him. I like the sound of those long, looping sentences so much. This sounds like it would be a good introduction before embarking on his fiction. Great review. I would definitely recommend A Heart So White, his Impac-Dublin award winning novel. And read the introduction first, in my memory it was valuable preparation for the way he writes. Well I don’t know if I’m his best advocate, but he has encouraged me to read more—especially now that I know where some of characters actually come from.